I leave it until it's overflowing and then Cassidy does it because he hates clutter. Genius, no? I do my own, though. I have since I was 13. That's a fantastic idea. My four year old has started bringing his laundry bag (a large Thirty One tote) back when I ask him to. I'm sure as he and his brother get older, it will be much more manageable of a task for them. Thanks for sharing this. Visiting from BYB. I like this idea! With 5 small people, I've given them each a weekday where they are responsible for washing clothes. If they need clothes before it's their day, they can ask their siblings to wash them or do a load themselves after that day's laundry is done. I wash clothes for hubby and me after the small people have finished their laundry. Interesting idea about 12 hampers. We would not have room in our house. We actually share one tall hamper for 6 people but do at least 1 load a day sometimes 2-3. My older children have been taught to start the laundry and even the 3 yr. old folds washcloths and bibs. For us, if we do a daily load of clothes, we prevent Mount Washmore. Notice I said "if". Doesn't always happen, then we have to dig our way out. I know it sounds like a lot of hampers, but two stand-up hampers in a closet should be totally doable. Some of the closets in this house are quite small and the hampers are in there, along with a lot of other things. 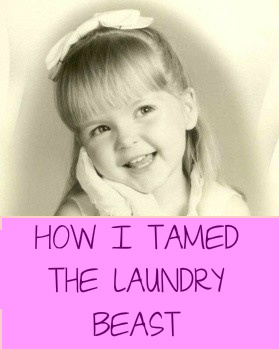 Before I started doing things this way we sent it all down the laundry chute and I sat for many hours of my life on the bathroom floor sorting clothes. Then, when they came out of the dryer I had to sort them again, and guess who owned each sock and t-shirt. For me, it has been totally worth it. My husband is a lifesaver- he made me a divided cabinet in the laundry with six baskets- one for each family member, one for sheets and towels and one for delicates. It has made my life so much easier! My kids know which basket is theirs and my husband has finally stopped leaving his dirty clothes on the floor. I LOVE it! So simple, and it makes so much sense! Starting at age 8, they learn while doing the laundry with me. As soon as they are capable, they take over their own laundry duties. Visiting from BYB! Good to meet you! What an awesome idea. Once my older two hit 13 they begin doing their own laundry. The little two aren't at that point yet. I love this idea Ill have to try it here. This is a good idea. I'm thinking of doing something similar. Our laundry is out of control at times!